You can find our partnership main website here. Let our machine know you are a human? We like to avoid spam whenever we can! Thanks. On August 15th, the SmithMartin Partnership team were invited to a book launch and family event at South Africa House, Trafalgar Square London. There were sandwiches and cakes, balloons and celebrations as the Mandela family led us in storytelling and reflection about Nelson Mandela’s life and hardships, eventually securing the end of apartheid in South Africa in 1994. Zindzi Mandela, who is currently serving as her country’s ambassador to Denmark is the youngest daughter of Nelson and Winnie. She wanted to write a book so children could understand on their own terms about her father Nelson Mandela. Grandad Mandela is written by Zindzi and two of her grandchildren, Zazi and Ziwelene, illustrated by Sean Qualls and published by Lincoln Children’s Books. Zindzi had grown up in Soweto and when she was 18 months old her father, Nelson was sent to prison, and her mother, Winnie, was banished to the Free State, taking Zindzi with her. There was no schooling and she only had chance to finish her education when she was sent to Swaziland. In 1985 she gained a BA in Law at the University of Cape Town, In February 1985, she had read out Nelson’s refusal for a conditional release from prison by P.W.Botha. Zindzi also accompanied her father at his inauguration as President and was First Lady following Winnie and Nelson’s divorce. An incredible woman, she has a special place in history during those turbulent and impossible times in South Africa. Unbelievable now, that apartheid could have ever happened, working in a multi-cultural city like London…there is so much we take for granted. Zindzi spoke about the need to write this book so children can discover on their own terms about apartheid and the struggle to overcome it. She said children should get answers to the questions they have. The work of Nelson Mandela in ending apartheid is now legendary and his strength and stalwartness in the pursuit of peace and forgiveness should be shared across the world. The video below gives some of the words from Zindzi. 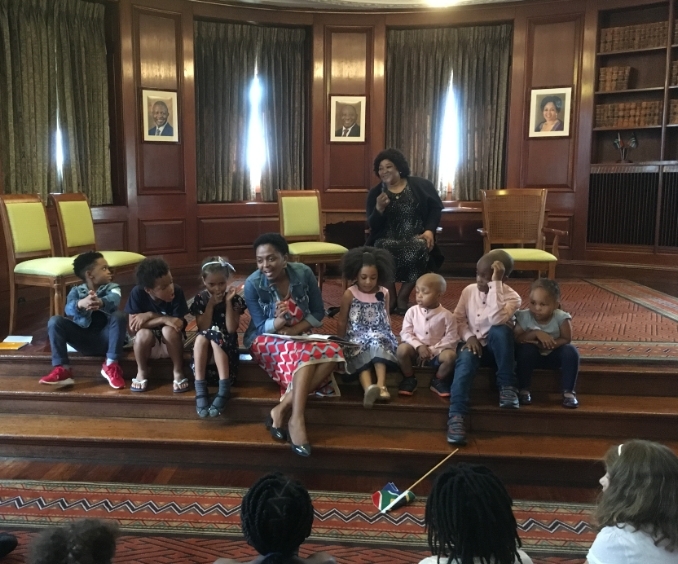 Thembi Tambo, the High Commissioner for South Africa in London, welcomed the family and explained that Zindzi had gone through a difficult childhood when Nelson Mandela was in prison for 27 years. Thembi Tambo explained also about the life experiences of Zindzi and how she has must have hidden away any anger and fears, remaining strong in her belief and in continuing her work. She said it was difficult to imagine a better way in which to allow children to access the information than through this book. “There are many stories but some are just too hard to share”. The Mandela Legacy organisation helped in the promotion of the book, and in organising this event, to support those who wish to have a voice and create a platform for sustainable development. The children helped to read Grandad Mandela and were also asked some questions about human rights. One of the answers was, “You can’t judge children by how we look and feel. We are all fine just as we are”. A stunning answer from an eight year old. The book Grandad Mandela, the work of Nelson Mandela and now his family shows what can happen to make changes for the better and the enormous courage and work needed to make it happen. We are always happy to explore new partnerships and projects in our core expertise areas - childcare, early years, education, charities, social business, governance, fund raising, literacy, books and web communications to support the work across all sectors. Share our Partnership news with the world! The very best from our Partnership for the New Year, hoping to work together to support more projects, settings and community enterprises in the months to come. Ofsted Self Evaluation Forms are no longer needed. The Ofsted SEF or self-evaluation form, as produced by Ofsted are longer a requirement for Early Years Providers. This is great news, although many providers have been producing their own evaluations linked to their planning and outcomes for some time. The SEF was undoubtedly a good management tool for creating information about the setting and giving practitioners a place to be reflective about their practise. We are often involved with early year’s providers in action planning, assessments, outcomes for children and management and governance. For many, this will come as welcome news and in the long run I am sure that this is the case. Settings who have become reliant on all the information needed for the Ofsted inspector being available in the SEF will now need to use other tools in their toolkits. One of the best methods we suggest is to integrate the Action Plans across the setting and the curriculum into a document that can be translated into overall planning. Using a RAG system can easily identify and provide a timeline for actions needed and indicate systems and procedures which are working well. You can always be bold, and use gold or silver to show that expectations are exceeded!! “While managers and staff of childcare settings need to be able to evaluate the care and activities their setting provides, and how well they are meeting the learning needs of children to an Ofsted inspector, they do not need to fill in the SEF. This is clarified in the inspectorate’s myth-busting campaign. The Pre School Learning Alliance also mentions that the need for the SEF is part of the myth busting campaign from Ofsted Early Years teams and that by no longer needing to complete the SEF this will enable managers and practitioners to reduce some of the administration burden and be more focussed on the delivery of the Early Years Foundation Stage. I wonder how many settings will stow away their SEF into the bottom of the cupboard and how many will already have developed their own systems and happily send the SEF to the famous filing cabinets! The UK is moving fast towards the next general election, debates, broadcasts, chat shows and face to face meetings. But what are they going to do to help families? So much talk and we wonder what the action will be? Pledges for childcare are hot in the press, promises, considerations, making life better and much more. It was with huge interest that our partnership read the blog from Family and Childcare Trust called: General Election 2017: What are the parties going to do for families? In the last week all the main party manifestos are launched with main committments and pledges. Well worth reading!! Our partnership remains fundamentally in support of high quality, affordable and accessible for all families and an effective choice to ensure that children grow and develop, thrive and learn, both within families and in childcare settings. We work within local authorities and directly with settings to ensure that we are at the forefront of understanding and development. Family and Childcare Trust are a campaigning organisation with a strong voice towards government understanding. 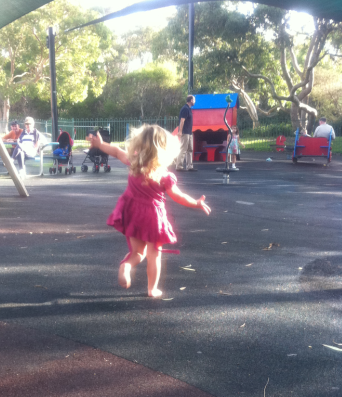 Join us in supporting Family and Childcare Trust in their committment to families futures in the next parliament. The Office for National Statistics have this month (May 2017) just published another edition of the research generated by The Social Capital Project. The ONS research key indicators of social capital to measure our societal constructs, begin by defining social capital as ‘…the connections and collective attitudes between people that result in a well-functioning and close-knit society‘. Social captal, the ONS argues, is a useful indicator of ‘…positively functioning well-being, economic growth and sustainability‘. (We like the framing concept. A better composite measure of human well-being, despite its overt press for economic growth. Better still than measures of ‘human capital’. Prof. Peter Fleming of the Cass Business School has, ahead of his new book The Death of Homo Economicus, written a comdemnatory article of this latter movement in the US journal aeon. Explore it further here…). This new ONS Social Capital report builds upon a 2016 version, ‘Measuring national well-being: An analysis of social capital in the UK‘ . The original twenty five key indicators have been modified slightly in this new edition, although the report intent and key analysis remains the same. See the full ONS report here (.pdf). 1. The most recent data show a largely positive picture of social capital in the UK over the longer-term with over half of the indicators showing improvement over a period of 3 years; a majority of indicators showed improvement or no overall change over the shorter-term 1 year assessment. 2. Most adults in the UK have at least one close friend, rising from 95% in 2011 to 2012 to 97% in 2014 to 2015. However, there has been a fall in the proportion of people saying they have someone to rely on a lot in case of a serious problem; this figure fell from 86% in 2010 to 2011 to 84% in 2013 to 2014. 3. Over two-thirds of UK adults (68%) report stopping and talking to their neighbours in 2014 to 2015. 4. More people are engaging in unpaid volunteering; in 2010 to 2011 the figure was 17% compared with 19% in 2014 to 2015. What we find interesting in a time where the surface layer of community would, taking a ‘tabloidest’ view perhaps, be comprised of dissent, emnity and huge inequality – there appears to be, in the human interactions referenced, a solidarity and an acceptance of the ‘the other’ that media headlines would deny. The data presented indicates that this local solidarity is not shaded interpretation or government spin. The broadly rising ‘close friendship’ indicator may be that in times of community erosion or flex, then people will talk to each other more, seeking a compassionate connection in the face of adverse societal perceptions. That we now have less people to rely on in emergencies or difficulty may be an indicator as to the qualitative depth of those interactions. We are less likely, perhaps, to seek aid and succour from those whose political opinions, or economic empowerment, we now know radically differs from our own. The indicator on neighbourliness, whilst good in itself, is a pointer to a shallower qualitative social encounter perhaps? (Not least further affected by the ‘Brexit’ referendum perhaps? Working in the Third Sector, as we do, the most telling headline for us is the rise in volunteering. This can be a reflection of, for example, more food banks need more people to staff them. More likely, in times of fractious community or political change, the Third Sector and an engagement with it, sees the power of voluntary group activity continuing to manifest itself. To create your community enterprise or social support service with volunteers provides balm to a troubled community, no doubt, but also increases self confidence, active participation and engagement in communities which hugely benefit the skill set and self-esteem of the person volunteering too, we would argue. It is heartening that this indicator, in the report, shows a consistent rise from 2010 onwards. Section Eight of the full report contains the Trust and Co-operative Norms data, drawn from a variety of sources. Whilst 70% of survey respondents say that ‘…most people in their immediate area can be trusted’, only 35% have trust in central Government, and only 35% of respondents indicated that ‘most people can be trusted’ on an aggregate view of their nation, or beyond their local neighbourhood. In our small way, we work creating community projects across the UK, and work to engage a wide variety of families, children and young people and Third Sector organisations. Those communities, for us, are conditioned by their similarity, not their difference. The old maxim, that cities are in fact a collection of villages, holds true, we think. From within, all our neighbourhoods, in our experience, are populated by individuals striving for their contentment and happiness, to add to their community’s social capital, if you will. The measure of our own social capital, and happiness, from the reading of this ONS report is perhaps to step up the fight on inequality and to resist ‘tabloidism’ and the ‘three word headline’ when thinking in community or humanitarian modes. You can read more about the ONS Social Capital Project on-line here. Coda: The psychologist Robert Waldinger, in a TedTalk of 2015, discussed the findings of the Harvard Adult Development Study. Continuously tracking the lives of 724 adult U.S. males over a sustained period of 75+ years to now..
What can be drawn from the research is the immense importance of relationships and community, in the emergence of healthy, active and content lives. Clearly the pursuit of wealth, fame and other ‘commonsense’ consumerist goals for achievement fall away in terms of objective true value. It is interesting that the ONS study above should be focused on human capital as a driver for economic growth. Whereas, in the Waldinger thesis, the very opposite is true of long-lived, happy humans. Oh that government should directly invest in equal measure, then, in the voluntary sector, with all its diversity, complexity and community affinity, as it does in trying to achieve economic micro and macro permanent ‘market’ growth? Now that would make us happy! Pursuit of happiness is on the global development agenda, but not enough is being done to address learner well-being. UNESCO’s ‘Happy Schools’ framework (pdf) addresses the disparity. 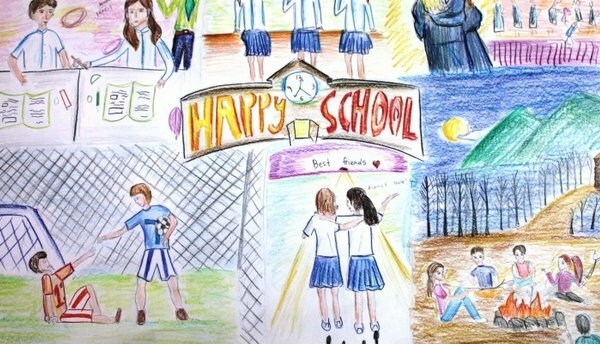 The Global Partnership for Education has a wonderful blog referring to the UNESCO’s Happy Schools framework, whch was originally launched on March 20th 2012. We hear so much about achievement and attainment levels and the need for testing and assessment so it was with real joy that I read the article and found that there are others who know that happiness is key to learning. If a child is not happy they do not find it easy to learn! Some of the source comments are quoted below. They makes inspiring reading and a great encouragement for education principles which believe in the word ‘educatio‘ meaning ‘leading out‘, rather than levels and testing assesments. 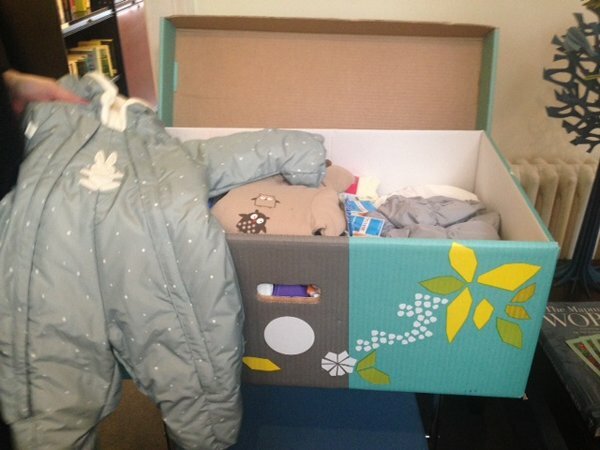 One of the most beautiful things we have seen is the Baby Box for all newborns in Finland. ‘I started life in a box, we all did!’ said a colleague, who was proud of the equality given to all babies in Finland since 1938. An equal start, and an equality in society that is mirrored throughout life. Every Finnish mother receives a maternity grant when baby is born. We started to get really interested in the concept of the box. At our meeting in the Finnish Embassy, which was actually not to do with provision for babies, we were shown the most beautiful boxes. The box has a mattress and sleeping oufits so the baby can sleep in the box for several months of their life. The contents of the box include all that you would need for a new baby, and in excellent quality. The clothes, including very warm snuggly ‘all in ones’ are in colours that are gender neutral, and really beautiful. Who would not to have one of these? An equal start in life it really is. And an equality that pervades the whole of the Finnish culture. The baby box has been available since 1938 and is provided as the maternity grant. Mothers can choose between cash and the box. 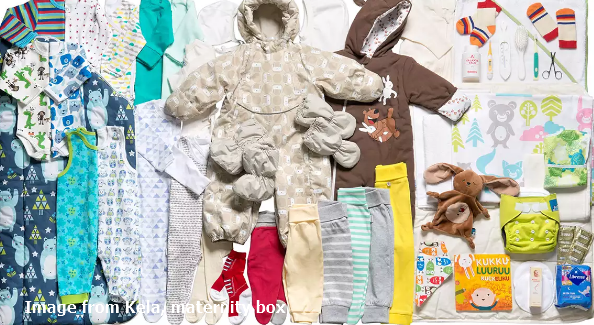 Of the 60,000 grants distributed annually by Kela, Social Insurance Institution in Finland, two thirds are taken as maternity packages as the baby boxes with contents. In the 1960’s sleeping bags first appeared in the boxes instead of quilts. By the 1980’s and 90’s families had become better off, but since the package remained as popular as ever it was decided to continue. In the 2000’s the boxes continue and the contents are reviewed annually by a social insurance committee following a competitive tendering process, in which quality and affordability are equally important. The boxes are available to purchase for anyone living outside Finland, who is not covered by the Finnish social security system, and can range from a Summer Basket to a Cold Winter Basket. 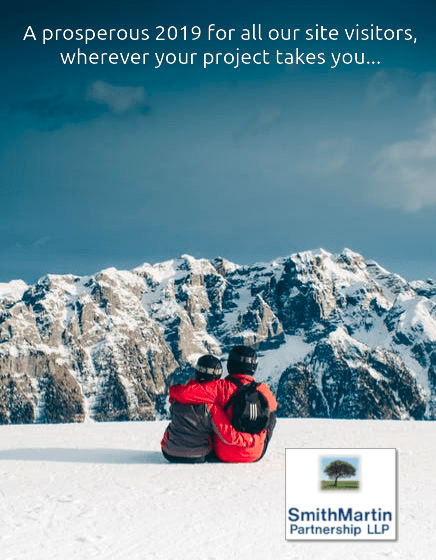 Our partnership is very socially minded and this idea has a huge appeal, so simple, so beautiful and yet so practical. It provides an equal start in life and a pride of life in a box shared by all citizens in Finland. We do a lot of desk research on the web, to find protocols we can recommend to clients, as well as looking for new material and content for the web sites we produce, for ourselves and others. Using the big search engines is fine, but sometimes on a wet Wednesday in March, you long for the search sensation to be a bit livelier, a bit un-normative. Developed to deliver consumer insight in the ‘Age of Google’. We used our standard format testing keyword ‘trees’ and the search results looked like this. You can choose a variety of approaches to your keyword or phrase. We bet the next time you are deliberating over some stats, or working on a bid, the Answer the Public might help refresh the text. It really does offer insights and approaches to subjects which, although designed for marketing professionals, can help refresh a jaded search palette. Using natural language processing, the search engine claims to identify relationships between documents and data that are ‘overlooked by conventional search engines‘. With over 18 million documents in their database, you are sure to find new data and information for your project or narrative. You can conduct your search in privacy, with no intrusive advertisements and can pivot your search to a new variety of search sources with a single click. Another secure, private search engine that offers a new insight into your chosen subject. No tracking, just search. Looks and sounds like Google, but with none of the lingering oversight, allegedly. Worked quite quickly on our standard searches too. ‘Oscobo is a UK-based company founded by two guys who left their corporate jobs to work towards a belief they both shared – that personal data should remain just that, personal. Disillusioned with the corporate world and that the private individual is paying for what seems to be “free” internet content, they felt it was time to turn the tables the other way round. Whatever new changes and needs for your project in 2017, all our best wishes from SmithMartin LLP. If we can help, with or without a search, just ask. We’d be delighted to hear from you. Preparing for Christmas we realised that although we have a number of active and complex projects moving ahead into 2017, including more international book and author events, web and communications build-outs for community clients and development of our literacy and book projects, we had no homework! So we have signed up, via the latest batch of FutureLearn subjects, to a course on Social Business and its development, delivered in partnership with the Universat Pompeu Fabra in Barcelona. Social Business: a Sustainable Way to Face the Most Pressing Needs of Our Time, as the on-line collaborative course is called, will enable us to test our belief that we are a social business, effectively working as a not for profit company, or rather generating profits with social outcome as the expected significant return. ‘We will begin by defining a Social Business according to Professor Muhammad Yunus, Nobel Peace Laurate 2006. We will look at how a Social Business is different from other similar concepts such as Social Economy or Social Enterprise’. We hope to see how the theories of Muhammad Yunus match our delivered practice, and to discover how other international social business developers interpret their work through the academic theory and practical dialogue that the ‘Pompeu Fabra‘ course will deliver. The course is free and lasts for four weeks, but is designed to enable you to both learn and share your experiences in just a few hours a week. We’ll let you know how we get on. Happy Christmas to all our readers! Image: Mother and child in Sweden, ready for winter? Joanna Goddard’s U.S. on-line journal, A Cup of Jo, has been publishing a series of articles in recent years about motherhood and parenting across the world. You can find the collection here. There are some surprises in store. What has amazed us, reading the collection of articles, is the wide variety of rules and regulations, benefits and opportunities, as well as the universal nature of care for children, expressed in the detail of the articles. The latter not a surprise. The context for the articles, in our times of benefit cuts, constrained resources and political alienation, is that there exists a variety of models for parenting and parenting support. They depend on the socio-cultural norms of the country under examination. They depend on the economic ‘depth’ of the country too. They all depend on that universality of love that parents offer. The article we liked the most, 14 Surprising Things About Parenting in Sweden, features parents and child, originally from the USA and Brazil, declaring their experiences of life in Sweden. Cultural norms in Sweden are different. For example, leaving your child, heavily swaddled, out of doors in the midst of a Nordic winter takes courage. However, parents are given 480 days of paid leave, post arrival of a child, with 90 of them dedicated to the father. Childcare costs cannot exceed $150 a month, and we got very excited for parents reading about Vabbing – the principle of the state paying salaries when you have to stay off work to care for sick children. We also liked the Law of Jante, another cultural principle really, that insists ‘…that one individual is not more special than any other, and you’re not to behave as if you are‘. A great pre-cursor for enhancing social equality? Although we recognise that in some acquisitive cultures this lack of focus on success and ‘high performance’ might jar with some parents. As booksellers we were truly delighted to read that Pipi Longstocking and Alfie Atkins are as popular as ever with Swedish children. Who could guess? Dipping into the article series on the ‘motherhood’ pages of A Cup of Jo is an uplifting experience, particularly in the midst of a grey English winter. It also shows that with all the pressures of parenthood you are not alone and that there is always a different, even better way, to do things too. Motherhood Around The World – we recommend it.